Papaya is a tropical fruit mainly consumed for its orange, sweet and juicy pulp. The seeds of this fruit are used dried. It is eaten as fresh fruit, cooked or used for processing various products like ice creams, refreshments and jellies. It is low in calories and a highly digestive fruit. Papayas are rich in water and low in calories, providing with minerals like calcium, phosphorus and iron and vitamin A and C. It contains papain, an enzyme that favours digestion. Papaya is a tropical fruit that is mainly consumed for its pulp, usually having an orange colour and sweet and juicy taste. The dry seeds of this fruit are also used. It is eaten as fresh fruit, cooked or used for processing various products like ice creams, refreshments and jellies. It is low in calories and a highly digestive fruit. Papaya is a tropical fruit, having oval or pear shape, measuring between 10 and 20cm and usually weighing between 500 and 1,000g, although it may even weigh up to 5kg. It is a berry of thin skin, of a green yellowish and orange colour. The pulp is of a red orange or yellow colour, sweet and very juicy. Inside the fruit there is a cavity containing the greyish black seeds. 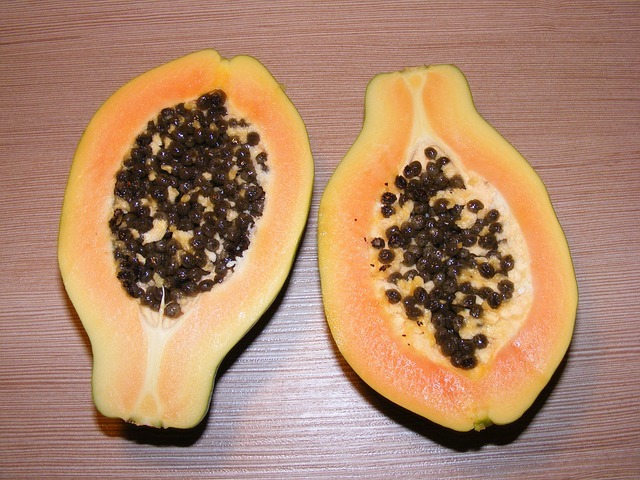 The papaya is cultivated for its pulp and dried seeds. The mature fruit is usually eaten as fresh fruit, in slices, with sugar and lime juice or in fruit salads. Green papayas are cooked. Several by-products are made from this fruit: jam, refreshments, ice creams and jellies, along with preserves. It is low in calories and it barely supplies with proteins and fats. It is rich in vitamin A, C and potassium. Besides, it contains papain, an enzyme that degrades the proteins, resulting in a very digestive fruit. 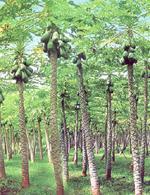 Papaya is a shrub that grows quickly, reaching in a short time up to 10m high. It has a thin, turgid stem of greyish colour and large leaves formed by several lobes. Three types of papaya are distinguished, some with feminine flowers, some others with masculine flowers and the rest bearing hermaphrodite flowers. The fruit is a great berry of a yellowish colour and a sweet and juicy pulp. Papaya belongs to the Caricaceae family, its scientific name is Carica papaya. It is a giant herb that grows quickly, having a short life. The stem is thin, turgid, cylindrical, smooth, spongy, juicy, hollow, of grey colour, generally simple, although it sometimes branches. It measures between 2 and 10m high, and 10-30cm of diameter. It is hardened by great scars caused by the fall of leaves and inflorescences. The leaves are dissected and clustered in the apex of the trunk and branches; it is characterized by having a long petiole. They measure between 25 and 75cm of diameter and are composed of 7-11 great lobes. The upper side of the leaf is of a bright dark green or yellowish green colour, whereas underneath it is of a pale yellow green colour. The petiole is long, around 25-100 cm long and 0.5-1.5cm of diameter. The plants of this species belong to three different types: those bearing feminine flowers only, those with masculine flowers and the type bearing hermaphrodite flowers. The fruit is an ovoid or pear-shaped berry, large, fleshy, juicy and of a yellowish green, yellow or yellow orange colour. The pulp is of an orange or reddish colour, with multiple seeds. It measures between 10 and 25cm long and more than 15cm of diameter.